This scroll exemplifies the style of decoration that flourished in the Italian towns of Ancona and Lugo from the eighteenth through the early nineteenth centuries. The artists in these towns specialized in a technique wherein the parchment was cut away to create an intricately patterned frame for the text. This technique was employed to adorn megillot, ketubbot (cat. no. 63), and a variety of Jewish wall hangings. 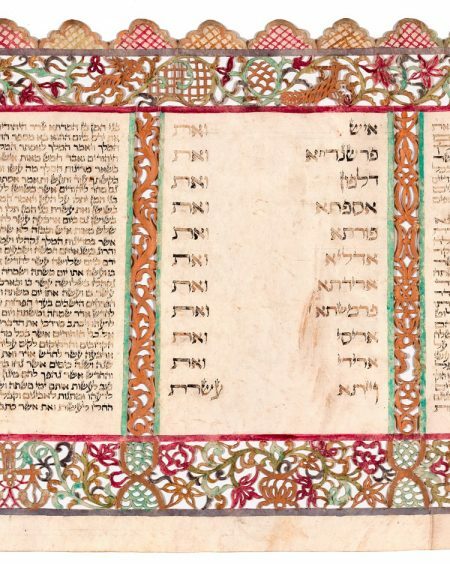 This megillah was hand-colored and embellished with gold paint, which has since oxidized. The use of expensive materials, in addition to the labor-intensive process required to create the elaborate border design, indicate that this scroll was a luxury object reserved for the wealthiest of patrons. 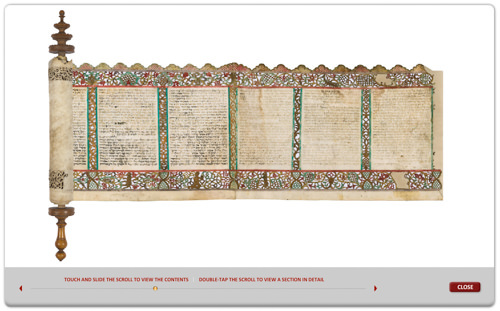 Few such Italian cut-out parchment scrolls remain today. The artist has incorporated peacocks, butterflies, and deer into the floral design of the upper border and integrated the Signs of the Zodiac below many of the text columns. The images of Cancer (crab), Pisces (fish), and Libra (scales) are rendered with lace-like delicacy. Zodiacal imagery is found in both decorated ketubbot (cat. no. 57) and megillot. While the zodiacal images serve a decorative purpose, they also have meaning that is specific to each type of document. The Signs of the Zodiac are employed in ketubbot as visual references to the salutation mazal tov, a wish that a newly wedded couple’s life together should be positively influenced by the mazal (sign) under which their marriage is taking place. In megillot, however, the Signs of the Zodiac are a reference to the recurrent theme within the story of Esther of the role that chance plays in determining the course of events. In the Talmud there is frequent discussion among the rabbis concerning the role of constellations in shaping human lives. According to the dominant rabbinic view expressed by Rabbi Hanina, “Israel stands under the stars’ influence” (Shabbat 156a). It is not surprising, therefore, to find zodiacal imagery embellishing the text of Esther scrolls, where the fortunes of the Jewish people depend on the casting of lots. Christie’s New York 2006, lot 205; Fishof 2001; Mintz 2001, pp. 50–51; Sotheby’s Tel Aviv 2000, lot 202; Shadur 2002, p. 86; Stern 2007, pp. 68–69.